In the bay area where the majority of families have two full-time working parents, many children are at school for up to 9 hours per day. There are many Montessori schools and traditional preschools in the area that offer a before-school program and an after-school program. These programs are typically held in another classroom that is filled with what we consider traditional children’s toys. Children are usually dropped off before school, where they play for anywhere from one to two hours, then they move into their classroom for the day. After the educational program is over (usually around 3:00 or so), the children are shuttled back into the room filled with toys. An afternoon snack and playground time is also a typical part of the after-school schedule. Montessori School of Silicon Valley implements an All Day Montessori program. What does an All-Day Montessori program exactly mean? Why does an All Day Montessori program matter? Won’t these children be exhausted by the end of the day? Do they ever get to play? Being a part of a consistent environment with authentic Montessori materials helps to create consistency and order in a young child’s mind. There are no opportunities for the children to get confused with working with “Montessori work” and playing with toys in the classroom. Some of the children actually spend more time at school than they spend at home. The classroom belongs to them, this is their environment. By spending the day in “their classroom”, trust, ownership, independence and pride is instilled. They care about their classroom, the environment and their other classmates. Spending the whole day in their own Montessori classroom limits transitions, which can be confusing creating uncertainty and frustrating to young children. Just like the Montessori work period, by no means will the children be expected to do all of these “before-school” activities. As is the case in all authentic Montessori environments, the children will have the choice of doing these activities in the morning. Should they not choose to prepare the classroom for the day and participate in the preparation of the snack for the morning. Whether its’ washing a table, reading, or practicing addition facts, children will have the choice of working on any activity in the classroom that they have had a lesson on. 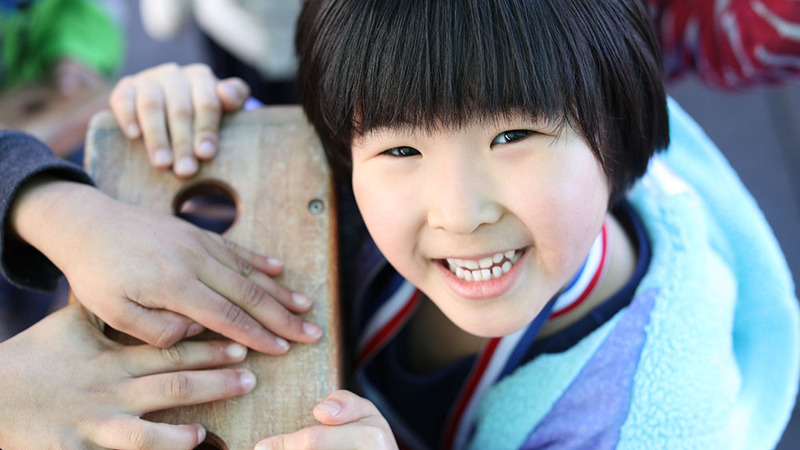 Our experience is that children are deeply connected to these sorts of activities, and by providing these opportunities, the children are more connected with their environment and their classmates. This makes the classroom feel more like a second home and creating a strong social cohesion among them. Afternoon work period which includes any outside services like, dance soccer, bucket drumming etc. Children in a fully implemented Montessori environment will always have the opportunity to choose what they would like to do. This includes (but is not limited to) observing other children, walking around the classroom, chatting with friends, or sitting in the library area quietly and looking at a book. By no means will children be “studying” their math facts or writing and reading all day long with no breaks. Without many “transitions”, children are able to settle into the day and make meaningful choices. Assistant teachers who work along-side the Montessori guides, lead the studios at the Montessori School of Silicon Valley. Since the Assistant staff work in the classroom all day, they know the children well and by leading the studios they allow for the lead guides to have time to do things like prepare the classroom, record lessons and observations, meet with parents & other staff, etc. The studio comes to the classroom which provides the children with the opportunity to choose to participate in the studio or continue with traditional Montessori work. We currently offer daily Art, Gardening and Cooking studios are in 12-week sessions from 4 pm to 6 pm. Children in the afternoon program can choose the studio program, Montessori curriculum, independent art, cultural and other practical life activities in the classroom. The Enrichment Studios are designed to be “process centered”. At the end of each 12-week session, each site holds “Studio Openings” providing anopportunity for the children to show off their work to their parents!